Americans see water as abundant and cheap: we turn on the faucet and out it gushes, for less than a penny a gallon. We use more water than any other culture in the world, much to nourish what’s now our largest crop—the lawn. Yet most Americans cannot name the river or aquifer that flows to their tap, irrigates their food, and produces their electricity. And most don’t realize these freshwater sources are in deep trouble. Blue Revolution exposes the truth about the water crisis—driven not as much by lawn sprinklers as by a tradition that has encouraged everyone, from homeowners to farmers to utilities, to tap more and more. But the book also offers much reason for hope. Award-winning journalist Cynthia Barnett argues that the best solution is also the simplest and least expensive: a water ethic for America. Just as the green movement helped build awareness about energy and sustainability, so a blue movement will reconnect Americans to their water, helping us value and conserve our most life-giving resource. Avoiding past mistakes, living within our water means, and turning to “local water” as we do local foods are all part of this new, blue revolution. Reporting from across the country and around the globe, Barnett shows how people, businesses, and governments have come together to dramatically reduce water use and reverse the water crisis. Entire metro areas, such as San Antonio, Texas, have halved per capita water use. Singapore’s “closed water loop” recycles every drop. New technologies can slash agricultural irrigation in half: businesses can save a lot of water—and a lot of money—with designs as simple as recycling air-conditioning condensate. The first book to call for a national water ethic, Blue Revolution is also a powerful meditation on water and community in America. It is particularly relevant for Plymouth residents as we still have an opportunity to avoid the water disasters that have hit so many cities, towns, and regions. By planning now, we can keep the water in our sole source aquifer plentiful and clean. 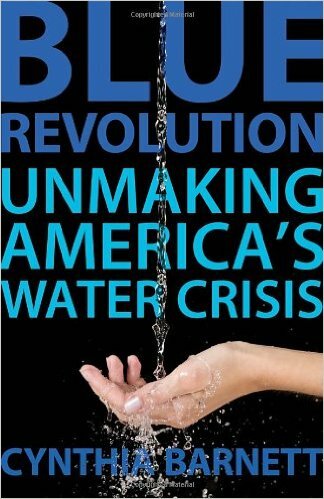 On December 12th, we will discuss this book, Blue Revolution: Unmaking America’s Water Crisis by Cynthia Barnett at 5 p.m. at 204 Long Pond Road in Plymouth. To sign up for the Book Club and receive notices about upcoming meetings email dorie@threebirdsconsulting.net.